As ISDN circuits have become less available and prohibitively expensive, post production houses and voiceover artists have been looking to replace their antiquated gear, without sacrificing the reliability and quality they have become accustomed to. Many of them have found their solution with Comrex. Comrex Corporation has been a leading innovator and manufacturer of high quality communications tools for the professional broadcast and live production/post production markets since 1961. Comrex has been an industry standard for decades, with a complete line of POTS Frequency Extenders, POTS Audio Codecs and ISDN Audio Codecs to meet the rigorous demands of 24/7 broadcast. But the advent of Internet Protocol (IP) technology in the early 2000s allowed Comrex to build on its legacy of contribution and distribution with Broadcast Reliable Internet Codec (BRIC) Technology. Comrex ACCESS and BRIC-Link II IP Audio Codecs enable broadcasters and voiceover professionals to connect to studios around the world with a simple press of a button. Radio stations, talk show hosts, program syndicators and national broadcasters around the world have made Comrex IP codecs the leading choice for point-to-point audio contribution and distribution. The proven reliability of Comrex IP Codec BRIC Technology and innovations like CrossLock VPN bonding and redundancy modes provide beyond ISDN-like reliability, quality and low-delay without the cost and circuit limitations. Tens of thousands of customers like the White House Communications Office, the BBC, Turkish Radio & Television, RCN Columbia, as well as syndicated talk show hosts and small to large market radio stations depend on Comrex products every day for remote contribution, program distribution and studio-to-transmitter links (STLs). To learn more, visit www.comrex.com or call us at 1-800-237-1776. 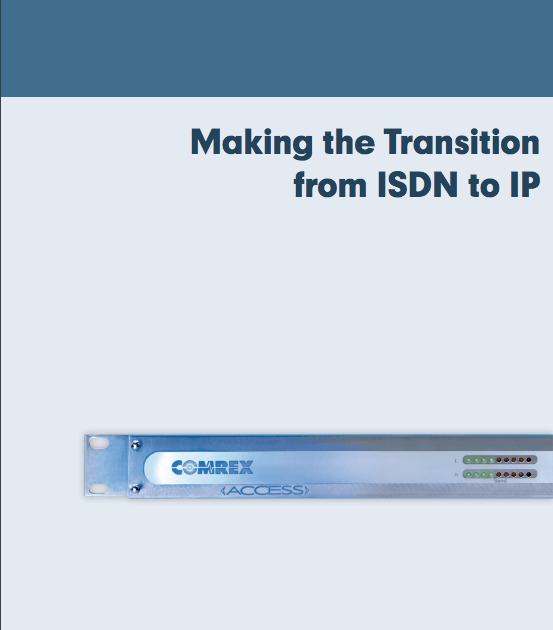 Click here to download our primer, “Making the Transition from ISDN to IP“.